A few days ago I went to make a call from my landline, and discovered I had no dial tone. I then realised… I haven’t received any calls for a couple of months (I don’t make calls from my landline). The engineer has now sorted the problem at the exchange, and I have landline service again. Why not take a look at what I can offer? Photography is an extremely effective way to market your business. It gives your customers an insight into the heart and soul of your business, so they can really get a feel for what you are about. Image and customer service is everything in the current retail climate, and you want to ensure you are doing everything you can to represent your business in a way that stands out from the crowd. People buy more from places that are visually appealing, and this is not only true for physical environments, but also when people are searching to buy online. Whether you’re a hairdresser, electrician or you own a fashion store, your customers want to be able to see what services you provide and get a feel for what you are like. If there is no appealing imagery, or any imagery present at all when they find you online, it can seriously decrease the chance of them carrying their search through to an actual sale. Andy Beattie Photography can provide your business with professional photography that will enhance your products and services, and bring a more personal approach to your current and potential customers. The imagery Andy Beattie Photography provide can be used to liven up your website, use for marketing material such as business cards and flyers, and are a perfect way to keep your Facebook timeline and Twitter feed interesting and fresh. We can discuss and plan what types of imagery will be most beneficial for you, so we get the very best out of the time I spend. 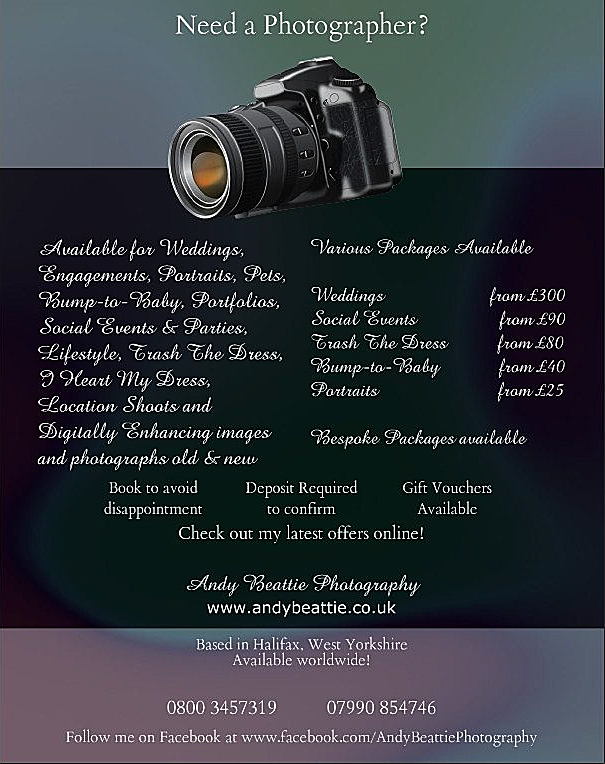 Please contact me to find out more about my photography packages for all kinds of businesses in the Halifax, Bradford, Leeds, Keighley and Huddersfield areas.